Homeschooling is a large and growing phenomenon in American society-between 1999 and 2007 it grew at twelve times the rate of public school enrollments, according to the National Center for Education Statistics. Current estimates suggest that about two million kids are homeschooled, but information about this booming population is terribly incomplete. Nearly a fourth of states don’t even require parents to notify authorities if they homeschool their children, much less offer any sort of verification that they are doing so. Of all the diverse groups of homeschooling families in the United States, conservative Christians are the largest subset, and it is this group that most influences public perception of and rhetoric about this movement. 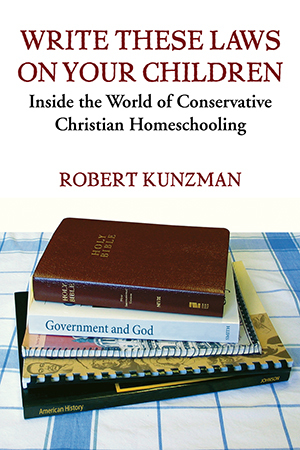 In Write These Laws on Your Children, Robert Kunzman uses his unprecedented access to six conservative Christian homeschooling families to explore this elusive world, from the day-to-day lives of its adherents to its broader aspirations to transform American culture and politics. Drawing from hundreds of hours of interviews and observations of parents and children, their churches, movement leaders, and related activities, Kunzman offers a behind-the-scenes glimpse into one of the fastest-growing education movements of the last twenty years. With Kunzman we visit homeschoolers in urban Los Angeles, central Vermont, rural Tennessee, northwest Indiana, and central Oregon. The families we meet range in size from one child to ten, and include parents who are professional teachers with advanced degrees as well as those who never finished high school. Their reasons for homeschooling are as varied as their families, and Kunzman takes on the invaluable task of showing us what their homeschooling experiences look like firsthand, what their political and religious beliefs are, and what their kids learn. This extraordinary access allows us to see conservative Christian homeschooling families not only as part of a larger political phenomenon-which is how they’re usually discussed-but also as unique entities with fascinating stories to tell. The growing popularity of homeschooling raises important questions about the value of ethical diversity, what it means to think for oneself, how we prepare our young people to be democratic citizens, and what role (if any) the state should have in the education of children. Beyond competing visions about the proper aims of education, Kunzman shows, lies a complicated relationship between faith, freedom, and citizenship. "An important, thoughtful contribution to the literature on homeschooling in particular and the literature on education in general." "The book has a remarkably balanced tone . . . This engrossing ethnography puts a human face on Christian homeschooling." This is the dream of a man named Michael Farris, cofounder of the Home School Legal Defense Association (HSLDA) and chancellor of Patrick Henry College (PHC), the nation’s first college for homeschoolers-- and what matters most about his vision is that the victorious movie director and the president of the United States are former homeschoolers and roommates at Patrick Henry College. Their conservative Christian upbringing and education have shaped much of their lives, and now they help shape the broader social and political culture in extraordinarily powerful ways. Farris talks about this dream of his frequently as he strives to generate support and enthusiasm for homeschooling and PHC. While we have yet to see such a scene play out at the Oscars, the surge in homeschooling and the growing influence of its conservative Christian organizational apparatus is hard to miss. The most recent data from the National Center for Education Statistics attest to homeschooling’s continued rapid growth, measuring a 74 percent increase over eight years--twelve times the increase of public school students over the same period. There are probably around two million homeschooled children in the United States today, but the simple fact is that no one knows for sure. Nearly a fourth of states don’t even require parents to notify anyone if they homeschool their children, much less offer any sort of verification that they are doing so. Nationwide surveys almost certainly underreport the total numbers, as many homeschoolers are strongly opposed to any kind of governmental oversight of their efforts, and therefore refuse to participate in any data-gathering attempts. While estimates vary widely, most observers acknowledge that conservative Christians constitute the largest subset of homeschoolers in the United States (the 2006 documentary film Jesus Camp uses a 75 percent figure, but this seems likely an exaggeration prompted by the dominant profile of groups such as HSLDA). I use the term conservative Christian for several reasons: while it includes most of those who would be labeled “fundamentalists,” it also extends to many evangelicals more broadly. The term conservative, however, alludes to a political as well as a theological perspective. While evangelicals hold political views across the spectrum, the families I spoke with, read about, and visited in their homes were far to the right politically--in some cases, they criticized Republican politicians and policies for not being conservative enough. Nevertheless, it’s important to point out that conservative Christians are hardly the only ones to choose this educational path for their children. Support and advocacy organizations serve almost every demographic imaginable. A quick check online, for instance, lists groups for disabled, Jewish, Latino, Catholic, Seventh-day Adventist, Mormon, single-parent, vegan, Native American, African American, and Muslim homeschoolers (the latter two, among others, both claim to be the fastest growing segment of homeschoolers). So if homeschoolers are actually quite a diverse bunch, why focus on conservative Christians? Admittedly, some of the “big questions” I explore in these pages relate to homeschooling more generally, such as what role (if any) the state should have in the education of children. But other vital issues--such as the value of ethical diversity, what it means to think for oneself, and the preparation of democratic citizens--gain an extra layer of complexity when deeply held religious convictions are involved. In addition, whether conservative Christians comprise two-thirds, onehalf, or even less of total homeschoolers, what seems beyond dispute is their disproportionate influence on public perception and rhetoric, and the ways in which HSLDA and state-level affiliates hold sway over much of the policy environment surrounding homeschooling. For better or worse (and some homeschoolers would clearly say the latter), the perpetual interplay of religious convictions and public life creates a complicated and combustible context wherein we continue to work out the shape and purpose of American education--and the meaning of democracy amidst diversity. How did this educational phenomenon of homeschooling--what a former research analyst for the U.S. Department of Education called “one of the most significant trends of the past half century”--gain such momentum over the past thirty years? Most observers trace the origins of the modern homeschooling movement to a liberal critique of institutional schooling in the 1960s by writers such as A. S. Neill, founder of the alternative student-directed school Summerhill, and Ivan Illich, a cultural critic who advocated the dissolution of institutional schooling. Within the next decade, former schoolteacher John Holt had begun publishing Growing without Schooling, a magazine advocating a form of homeschooling commonly known as “unschooling.” Unschooling eschews most traditional structures of formal schooling, instead letting children decide what to learn, when to learn it, and how. At its core, unschooling rests on a philosophical belief that children learn best when the focus and course of study emerge in response to natural interests and needs. While John Holt died in 1985, the organization that bears his name estimates that unschoolers comprise about 10 percent of the total homeschool population. Holt was not the only educator challenging institutional schooling during that time. In a 1972 Harper’s article titled “The Dangers of Early Schooling,” educational researcher Raymond Moore questioned the “race to the schoolhouse” and, over the next decade, made a case for abandoning schools altogether in favor of homeschooling. Like Holt, Moore also criticized institutional schooling for its standardization and impersonality, but whereas Holt’s philosophy of unschooling let the child and her interests determine the pace and direction of her learning, Moore emphasized the importance and authority of parents in the educational process. Regardless of which philosophy they favored, parents who chose to homeschool during the 1970s did so surreptitiously, since most states’ laws were unclear regarding its legality. A series of court challenges during the 1980s met this uncertainty head on, with the result that by 1993, all states had recognized parents’ rights to homeschool their children. Coinciding with these legal battles and the rise of the Moral Majority, the early 1980s marked the beginning of significant growth for homeschooling, particularly among conservative Christians. Many of them first heard about homeschooling when Raymond Moore was interviewed by James Dobson on his Focus on the Family radio program. In fact, both Michael Farris and J. Michael Smith, who cofounded HSLDA in 1983, credit Moore for introducing them to the concept of homeschooling, and Moore provided a fledgling HSLDA with his important endorsement. (Fifteen years later, however, Moore published a scathing criticism of Farris and HSLDA--part of a wider disenchantment with the organization’s disproportionate influence, described further in chapter 5.) The latter half of the decade saw perhaps a sixfold increase of the homeschooling population, to an estimated three hundred thousand. Rapid growth continued in the 1990s, likely topping one million by the end of the decade. Public attitudes in the United States toward homeschooling appear to have improved as more Americans have chosen the option. In 1985 only 16 percent of those surveyed by Phi Delta Kappa felt homeschooling was good for the nation; by 2001 this positive appraisal had risen to 41 percent. Despite the growing popularity of homeschooling, research data about its demographics and effectiveness are fundamentally incomplete. Any statistics claiming to provide a definitive picture of some aspect of homeschooling across the United States are, simply put, wrong. The truth is, we just don’t know for sure who is homeschooling or what they are learning. Homeschool regulations, as is typical with much educational policy, vary widely from state to state; some require extensive documentation, while others don’t even know (or ask) how many families are homeschooling within their borders. We have numerous anecdotes of spelling and geography bee champions, and the occasional horror story of physically abused children whose parents claimed to be homeschooling them. We have impressive standardized test results volunteered by some homeschool families; plenty of others don’t report them or don’t administer them in the first place. Many homeschoolers will not respond to surveys, particularly government-sponsored ones. Most education regulations aimed at gathering performance data, such as the No Child Left Behind Act, apply only to public schools. Even in states where registration and/or testing is required, substantial numbers of homeschoolers (including several families I visited) simply ignore the regulations. While this book focuses on the conservative Christian subset of homeschoolers, I’ve spent significant time exploring the broader movement as well. When I’m asked to describe the typical homeschool family, I generally respond by saying that you might as well describe the typical public school family--the range of demographics, philosophies, and practices make such a generalization practically impossible. Nevertheless, several common characteristics are worth noting. Homeschool parents believe they can provide a better educational experience for their child, and are willing to sacrifice their time, money, and/or careers to make it happen. They are frequently (although not always) dissatisfied with more conventional educational options, including a typical distrust of the public school system. Eighty-eight percent of homeschool parents in the 2007 National Center for Education Statistics (NCES) survey mentioned earlier identified “concern about environment” in conventional schools as a significant factor in their decision to homeschool. Perhaps the most crucial insight into the homeschooler mentality is that they generally view education as more than just formal schooling; as one Virginia parent explained, “It’s not just schooling; it becomes your whole way of life.” The rhetoric of “raising academic standards” and “restoring economic competitiveness” by policymakers and politicians at least partly misses the point as far as homeschoolers are concerned. For them, the educational process is first and foremost about their child’s individual learning needs, and extends well beyond traditional school standards, structures, and schedules. Describing the “typical homeschooler” remains an imprecise affair even when the focus narrows to conservative Christians. As my travels reveal, a wide range of philosophies, practices, and outcomes exist here as well. Nevertheless, certain aspects seem fairly typical. Whereas homeschool practices among the general population fill the spectrum between open-ended unschooling and highly structured replications of institutional schooling, conservative Christian families tend toward the latter-- reflecting their belief that human nature is inherently sinful and in need of regular guidance and correction, particularly during childhood. But even more central in the mindset of conservative Christian homeschoolers is the fundamental conviction that educating their children is a God-given right and responsibility, and one they can delegate only at great moral and spiritual peril. Like many in the broader homeschool population, conservative Christians see homeschooling as a twenty-fourhour- a-day, all-encompassing endeavor. For them perhaps more explicitly than for other homeschoolers, homeschooling is a shaping not only of intellect but--even more crucially--of character. This means more than just moral choices of right and wrong; character is developed through the inculcation of an overarching Christian worldview that guides those moral choices. These parents share a fierce determination to instill this type of Christian character in their children, a process that entails protecting them from the corrupting influences of broader society. To accomplish this, the family becomes the defensive bulwark and sanctuary wherein children are prepared for eventual engagement with the world.